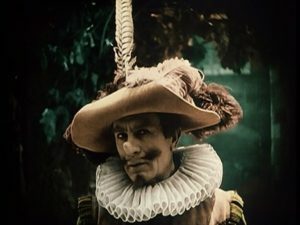 Augusto Genina’s Cyrano de Bergerac, based on Edmond Rostand’s 1897 play, was actually shot in 1922, but it took three years to hand-color every frame of the movie using a painstaking process called “Stencil Color.” Dubbing prints of the result proved to be very expensive, so few copies were made, and it’s a wonder the film has survived. For all that effort to give the film color, the results are strange—unconvincing, garish, and unevenly applied. But is the movie any good? Adapting a beloved play known for its language to a silent medium was a major challenge, and you have to give Genina credit for trying. For one thing, he uses a lot of close-ups, relying on his actors’ very expressive features to convey the story. For another, he just plain slaps more words up on the screen than is typical of most silents, sometime three cue cards’ worth in immediate succession. And during Cyrano’s big duel in the theater, in place of cue cards, the words are printed right over the images as surtitles, so the action doesn’t have to cut away. Unfortunately, this is more jarring than effective. And all these expedients don’t quite add up to success—the play is still a talk-fest, and watching a silent talk-fest is a strain. That said, shooting the film in the actual older streets of Paris gives it a richness of setting no Hollywood backlot could match, and the costumes are uniformly excellent. Pierre Magnier, who plays Cyrano, is inspired, and the film overflows with character actors who mug up a storm. The swordplay, alas, is mediocre stage-combat, but the classic story is as good as ever, the soldiers’ camp at the Siege of Arras is convincingly depicted, and Linda Moglie is one of the best Roxanes I’ve ever seen, radiating intelligence, spirit, and wit, as that character should. Unfortunately, the lugubrious last act is way too long, and the ending is sentimental sludge. All in all, a thoroughly mixed bag.